Using a good-quality toner is vital for people with oily skin. Excessive oiliness creates a thick greasy layer on the skin that can’t be washed away by a cleanser alone. A toner completes the cleansing process by removing the remaining bits of oil, dirt and dead skin cells from the skin. Toners also restore the delicate pH balance of the skin and shrink the size of the skin pores which is important for controlling sebum production. 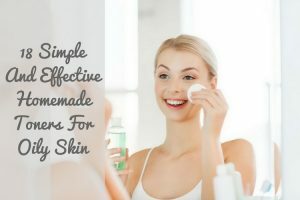 When it comes to daily skin care, it is best to opt for homemade natural home remedies using natural ingredients because most commercial toners contain alcohol and sulfate that irritates the skin and dries it out excessively. Here are the top 17 homemade toners that are effective in treating oily skin. Try any one of them as per your interest. Both lemon and witch hazel used in this recipe are natural astringents that tighten the open pores and reduce the amount of sebum on the skin. Squeeze out the juice of 1 lemon. Add 1/2 tablespoon of witch hazel and 2 tablespoons of water to it. Give it a stir, soak a cotton ball in the mixture and wipe your face with it. Repeat the process 2 times in a day after cleansing your face. Note – You can increase the quantity of witch hazel if your skin is excessively oily. Make sure to dilute the lemon juice with water before applying it to your face. Cucumber is a natural coolant that soothes the skin, closes the pores and reduces oiliness without drying it out completely. Chop a cucumber into small pieces. Add 2 cups of water to a pan and add the cucumber pieces. Boil the water till it reduces to half. Remove from heat and let it cool down completely. Blend the cucumber and water mixture and store it in a container. Soak a cotton pad in the toner and wipe your face with it. Apply the toner 2 times in a day after cleansing. The tannins in green tea draw out impurities and oil from the pores and reduce the large pores. It also hydrates the skin and prevents it from over-drying. Bring 1 cup of water to boil. Add 2 green tea bags to it. Let the tea bags steep in the water for 10 minutes. Discard the tea bags and let the tea cool down completely. Add a few drops of tea tree oil to the tea and give it a stir. Soak a cotton ball in this solution and wipe your face with it. Repeat the wiping 2 times in a day. Menthol present in mint works as a natural astringent and coolant that controls sebum production and helps to cool down the skin. Bring 3 cups of water to boil. Add a handful of fresh mint leaves to the water and boil it till the water reduces to half. Remove from heat and let the water cool down completely. Strain the water and store it in a container. Soak a cotton pad in this toner and use it to wipe your face two times in a day. Apple cider vinegar restores the pH balance of the skin and removes excess oil from the skin. Pour 1 part of apple cider vinegar into a container. Add 2 parts of distilled water to it. Stir well in order to mix the ingredients. Soak a cotton ball in this toner and apply it to your freshly cleansed skin. Note – Don’t apply this toner to the eye area. Opt for raw, organic and unfiltered apple cider vinegar to make the most out of this toner. The natural oils in Neem or Indian Lilac control excess oil production by the sebaceous glands present in the skin. It also prevents the problem of acne and pimples associated with oily skin. Add a handful of clean Neem leaves to it, cover the pot and boil for 10 minutes. Soak a cotton ball in this toner and apply it to your freshly cleansed face twice. Repeat the application 2 times in day. Neem oil controls the production of sebum by the sebaceous glands and reduces excessive oiliness of skin. The anti-inflammatory compounds nimbidin and nimbin found in Neem oil also help to soothe the inflammation caused by acne and pimples. Add 1 part of Neem essential oil to 6 parts of witch hazel and give it a stir. Soak a cotton ball in this mixture and use it to wipe your face after cleansing it. Aloe Vera restores the pH balance of the skin which in turn reduces excessive oiliness of the skin. The astringent properties close the open pores. Extract the gel-like substance from an aloe vera leaf. Take 2 tablespoons of the gel in a bowl and add 3 to 4 tablespoons of cold water to it. Mix it well and apply this mixture to your face using a cotton ball. The essential oils and antioxidants present in chamomile shrinks the open pores, removes excess oil, and impurities from the skin surface. Chamomile has high penetration capacity which makes it more effective. Bring a cup of water to boil. Add a chamomile tea bag to it and cover the cup for 10 minutes. Discard the tea bag and store the tea in a small bottle. Pour a few drops of this toner on a cotton pad and apply it to your face. The natural astringent properties of tomato juice tighten the skin pores and reduce the unwanted shine and sebum from your face. It also relieves skin irritation, rashes and itching. Take a medium-sized ripe tomato. Crush it thoroughly and extract the juice. Soak a cotton ball in the tomato and apply it to your freshly cleansed face. Leave it on for 10 minutes and then wash it off using water. For added benefits: You can add some honey into tomato juice. Rosewater helps to maintain the natural pH balance of the skin which in turn controls excess sebum production. The cleansing properties of rosewater open the clogged pores and remove the impurities. Using a cotton ball, apply rosewater all over your face. Leave it to dry completely. Repeat it after every wash.
For Added Benefits: Add 1/2 teaspoon of camphor powder into a bottle of rosewater. White vinegar balances the pH of the skin which in turn reduces excessive oiliness of the skin. The acidic nature of white vinegar makes it a powerful antimicrobial agent that helps to treat acne and pimples. Add a tablespoon of white vinegar to a cup of rosewater and mix with a spoon. Pour this mixture into an empty container. Use this toner to wipe your face after every cleansing session. Filtered or distilled cold water tightens the enlarged skin pores and helps to control the oiliness of the skin. Cold water also heals inflammation, acne and pimples. Take 1/2 cup of water and add 4 to 5 ice cubes to it. Let the water become ice-cold. Dab a cotton pad in the cold water and apply it to your face. You can also rub an ice cube all over your face and neck. Peach is a rich source of vitamins A, C, K, beta-carotene along with minerals, potassium, magnesium and selenium that help to maintain the perfect balance of skin oils and prevent it from becoming excessively oily or over-dry. These nutrients also protect the skin from the UV rays of the sun and heal inflammation. Olive oil is non-comedogenic in nature. It readily penetrates into the skin and nourishes it without clogging the pores. Take 2 ripe peaches and remove the skin and pit from the peaches. Mash them to make a smooth paste. Apply this mixture to your clean face and neck. Wait for 15 to 20 minutes and then wash off with cool water. Rice water tightens the enlarged skin pores and controls the accumulation of excess sebum on the skin surface. Rice water also promotes cell growth and stimulates blood flow to the skin. Take a handful of uncooked rice and wash it with running water. Soak the rice in a cup of water for a couple of hours. The water will turn milky. Strain out the water in a clean container and use it to wipe your face twice a day after cleansing. Egg whites have potent astringent properties that shrink and tighten the skin pores and reduce the accumulation of sebum on the skin surface. Egg whites also lift up the sagging skin and reduce the appearance of wrinkles. Break an egg in a bowl and carefully separate the egg white from the yolk. Apply the egg white all over your face after cleansing. Let it dry out on its own and then wash off with cool water. The slightly acidic nature of apple pulp helps to maintain the pH of the skin at a healthy level which in turn controls the production of sebum by the sebaceous glands. Glycolic acid present in apple works as a potent cleanser that removes dirt, excess oil and dead skin cells. Chop an apple into small pieces and blend them into a paste. Add a tablespoon of honey to the apple pulp and mix it with a spoon. Apply this mixture all over your cleansed face and wait for 15 minutes. Wash off with cool water. Vitamin C present in pomegranate juice helps to maintain the natural oil balance in the skin. Pomegranate juice is rich in antioxidants that nourish the skin and prevents skin damage caused by free radicals. Take 1/4th cup of fresh pomegranate juice. Add 2 tablespoons of distilled water and 3 tablespoons of witch hazel to it. Use this mixture as a skin toner after cleansing your face. You can store the left over mixture in an air-tight bottle and use it in future. Orange juice is a rich source of vitamin C that protects the skin against free radical damage, UV rays of the sun and other environmental factors that increase oiliness of the skin. It also unclogs the pores and removes accumulated dirt and sebum from the skin surface. The cooling impact of fennel seeds on the skin helps to control excessive oiliness by reduce the size of the skin pores. Take 1/2 tablespoon of fennel seeds and crush them. Add the crushed fennel seeds to 1/2 cup of hot water. Add 2 tablespoons of orange juice to it and cover the cup. Leave it for 20 minutes and then strain the liquid. Soak a cotton ball in this liquid and apply it all over your face after cleansing it. Menthol, the basic component found in peppermint has a cooling effect on the skin. It helps to soothe and heal inflammation caused by acne and pimples. Menthol also reduces the secretion of sebum by the sebaceous glands. Add a peppermint tea bag to it and let the tea bag steep for 5 minutes. Remove the tea bag and add a tablespoon of lemon juice to it. Mix it with a spoon and let the tea cool down completely. Soak a cotton ball in this tea and use it to wipe your face and neck after cleansing it. So, prepare these refreshing natural toners in your home using all-natural ingredients and say goodbye to oily skin, pimples and acne. Do you have a recipe for DIY natural toner for oily skin? Then please share it with us in the comments section.